It's an impressionist attempt to describe the artikulationsbasis. I agree it should at least be clarified in such a journal. I find it interesting that there is no Wikipedia article in English about "Artikulationsbasis" (the German one is here. Is it called something else in English, too? Basis of articulation or articulatory setting are used, but they aren't felt to be terms as much. So is artikulationsbasis as a concept just not discussed a lot in English-speaking countries? I was thinking about translating the German Wikipedia article into English, but I have a feeling it's too short and contains too few references to be accepted. Not sure, especially as it isn't really much of a hot topic in German scholarship, or is it? Yes, artikulationsbasis would be an interesting topic for a blog posting. An evergreen - that's how singing people deal with pronunciation in singing. They're pragmatic, if it gets the desired effect they're happy. You've written about it before. The way I read it she was comparing Italian to English, not Chinese. That might make a little more sense, since the vowels of Italian are a bit more familiar to us Anglophones. 'Ryan', you MUST give your full true name when commenting on this blog. Otherwise, you risk deletion. I also thought she meant that English is similar to Italian, but that made even less sense to me. 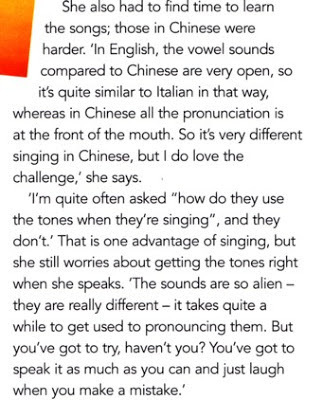 I read it the same way as Ryan, that she is saying English is similar to Italian, whereas Chinese is different. I wonder whether this be true, tho'. Chinese back unrounded vowels are as utterly unlike anything Italian as can be, whereas some English back vowels are or tend to be unrounded, like e.g. conservative STRUT or FOOT. On th'other hand, both Chinese and Italian have a centralized [a], which English has not. Maybe Ryan is right in the sense that Italian sounds somehow more familiar to an Englishman simply because the Englishman heard, has heard, and continues to hear it more often than he does Chinese---but not in the sense that the vowels of English and Italian are in themselves closer to each other than either is to Chinese. Yes, I think she's saying that English is similar to Italian in the sense that Italian style is familiar to English speakers, and Italian singing styles have influenced English singing (eg choirs are encouraged to roll our r's Italian style when singing in English). I won't comment on Chinese (where the reference is to Mandarin Chinese) because I am only familiar with southern varieties of Chinese like Cantonese. There's just no use people outside the teaching of singing trying to interpret what teachers tell students, because the words are in a strong sense not the point: if you tell your students to sing with "pear-shaped vowels" (as used to be done), and they sing the way you want them to, that's the whole purpose of the term and it has no further utility. A trick is a trick, and in no way to be confused with a scientific description, which may use the same words, but for wholly different purposes. What do pear-shaped vowels sound like? I think the idea is that the onset of the vowel (not of the syllable) reaches full volume rather rapidly, whereas the coda of the vowel tapers in volume rather slowly, like eating a pear fat-end-first. Given that Chinese phonetics is, as far as I know, a study of open monosyllables, I think that Mary-Jess is really trying to communicate the idea that she finds those Chinese songs have more 'syllables per second', so she has less opportunity to hold a note, and because the syllables come so thick and fast, she is getting the erroneous impression that the language has a frontal articulatory setting.